Photo credit: Seth Kaplan, CC BY 2.0. I got a text from Mike, one of my best friends from high school. Hey, what was the address of your old place on Wolcott? I texted him back the address and asked him why he wanted to know. He said that he was looking at a place in my old building and asked what floor I had lived on. My apartment was on the third floor. Turns out he and his girlfriend were moving in together and they were actually going to look at my old place. Great! This was fine. It was great. What great news. When they decided to take the place I was overjoyed. Wait, did I say overjoyed? I meant to say that I threw a tantrum. I didn’t say anything to Mike, because I am a good friend and a reasonable human being, but this was my apartment! My apartment! I may have left Chicago over four years ago and lived in several different New York City apartments since, but this apartment on Wolcott Avenue in Chicago was mine. Full stop. My apartment on Wolcott Avenue was the platonic ideal of a Chicago apartment. Top floor, two-and-a-half bedrooms, in-unit laundry, backyard with a grill, and it was close to the train but without the noise. If I wasn’t living there, I should be happy to pass on the good fortune to a friend. But I wasn’t. I am not an especially emotional person, so I was puzzled by my reaction. My initial worry was that I had developed a case of pants-feelings for my old friend, but the feelings were definitely not coming from my pants. The best way to describe how I was feeling was butthurt. It wasn’t quite jealousy, it wasn’t quite sadness, but just a sense of general, well, butthurt. While I knew what I was feeling wasn’t entirely rational, I knew there had to be something at the heart of it. So instead of ignoring unpleasant emotions like I prefer to do, I dug in. I had a glass of cabernet sauvignon and went at it. I was going to figure out why this all bothered me so much. When I made the decision to leave Chicago over four years ago, I had everything I thought I wanted. I had a perfect apartment in close proximity to many of my good friends. There were impromptu lasagna nights and we could easily shuttle between each others’ apartments during the brutal winters. I had a job at a folk music school within walking distance and I was finally hired by a theater company that I had longed to be part of since I first moved to Chicago. The only problem? I still wanted to be in New York more than I wanted to stay in Chicago. I wanted to write musicals. I had embarrassingly earnest dreams that would be hard to chase if I stayed put. I needed to see what would happen if I left my comfort zone. Since moving to New York, I’ve never seriously thought about moving back to Chicago. Even through terrible jobs, overpriced apartments, and bouts of loneliness, New York feels like home in a way that Chicago hadn’t. But I realized that even though my heart is in New York, I still felt like I could return to my old Chicago life if I ever needed to. If I got one more rejection for a musical writing award or went on one more lousy Tinder date, I could just pack it all up and head back to Wolcott Avenue. I could throw a lasagna in the oven, send a text message, and have my friends over for dinner within the hour like nothing had ever changed. But if Mike was going to be starting a new chapter of his life in my apartment, that meant I couldn’t return to that chapter of mine. It all made sense. 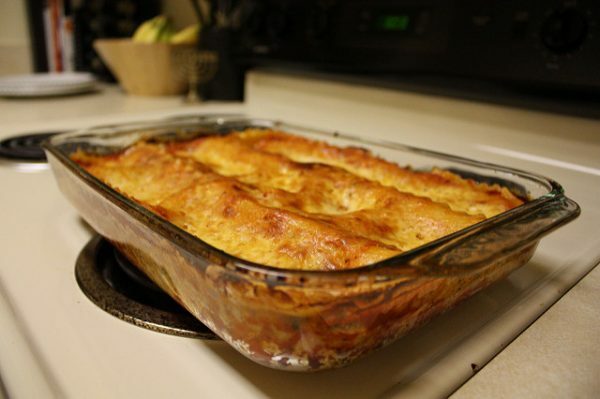 People have moved or had babies and can’t drop everything for lasagna anymore. Some of my favorite bars and restaurants have closed. Heck, my favorite grocery chain had even gone out of business. I knew deep down that if I ever moved back to Chicago it wouldn’t be the same, but had I written this story myself, I couldn’t have come up with such an obvious metaphor to tell me that I can’t go home again. Chicago’s not the same and neither am I.
I let myself mourn the place I couldn’t quite let go of when I left, and I now love the idea that one of my closest friends is living in an apartment that was so special to me. I also love that our other friends from high school tease him about trying to “single white female” my life. Even if we can’t come together anymore for lasagna nights, at least we can all still rally around teasing one of our own. Dyan Flores is a consultant and musical theater writer who lives in New York City. Burn it Down, her musical about Chicago Mayor Rahm Emanuel, will have a concert in New York this spring. You can find her on Twitter.